Alabama State Trooper Lucy Still made history in December 2015 when she became the first woman State Trooper in Alabama motor unit’s 80 year history to join the state’s motor unit, patrolling state roadways on a motorcycle. 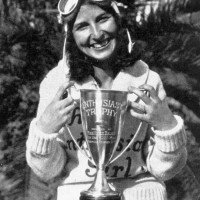 In the 1930’s Ilse Thouret was considered a star motorcycle racer by her country, Germany. Born into ‘high society’ in Hamburg, of French Huguenot extraction, Ilse was highly educated in typically German fashion, cultured, well read and multi-lingual. 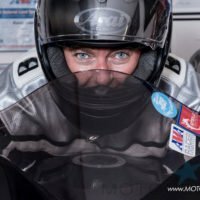 She had a reputation for being comfortable whether dancing on the ball room floor or clad in mechanics gear racing from success to success. Ilse Thouret was forced to remove herself from the track simply because women were not allowed to race. 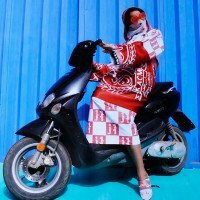 She became a wife and a mother raising two daughters who later made history racing motor scooters for Italy’s Vespa team just after the war. Ilse was a member of the DKW. DKW – In 1916 Danish engineer Jørgen Skafte Rasmussen founded a factory in Saxony where he produced a slightly modified version of this engine into a motorcycle and called it “Das Kleine Wunder” DKW — translated to ‘a little marvel’ “. This was the real beginning of the DKW brand, in fact in 1930 DKW was the largest motorcycle producer in the world. Ilse Thouret first race achievement was in 1927 on a 750cc *Mabeco where she finished first! This was just the beginning of her numerous racing successes over the next 10 years that followed. In addition, the first race she tried to enter, she was refused and forced to remove herself from the track simply because women were not allowed to race — it was too dangerous. 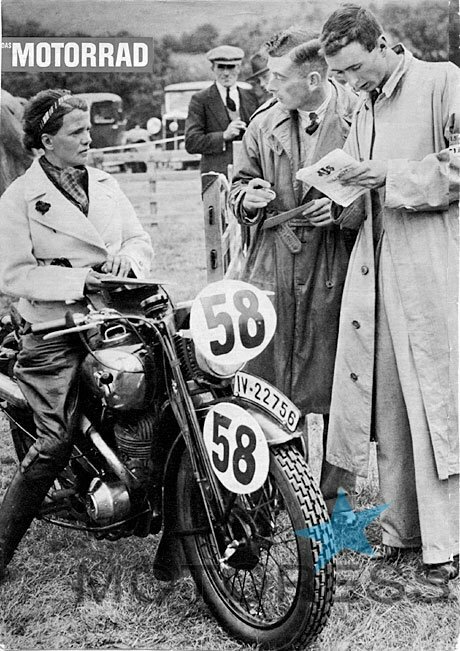 Ilse Thouret rode continuously in the forties not just motorcycle racing, she fought successfully against their male competitors though; during a time when few women on motorcycles were even riding. Her passion was riding a motorcycle, and her performance was rewarded with recognition. In 1933, one year after her first race she was made the “Austro Daimler Puch – The Thouret” as DKW’s factory rider. In 1934, she races on the factory supported DKW. HISTORY TIP: During the late 1920s and 1930s, DKW was the world’s largest motorcycle manufacturer. In 1931, Ing Zoller started building split-singles and this concept made DKW the dominant racing motorcycle in the Lightweight and Junior Classes between the wars. This included off-road events like the International Six Days Trial where the marque scored some considerable inter-war year successes alongside Bavarian Motor Works (BMW Motorrad). At the same time, the company also had some success with super-charged racing motorcycles which because of their light weight were particularly successful in the ISDT. Ilse Thouret also became a well-known advertising personality for motorcycles and also for tires, fuel and oil. In one advertisement a display on the 1840 km ride to Eilenriede race she says: “My 600-DKW machine with side car survived this non-stop driving without the slightest damage. Yes, I before I needed to repair for eight punctures”. In 1969, she died after a long illness. 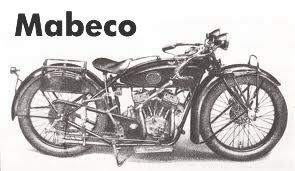 Mabeco was citizens of Berlin motorcycle factory of the circa 1920’s. The company name was derived from the owner Max of Bernhardt (and companion). The factory existed from 1923 to 1927. 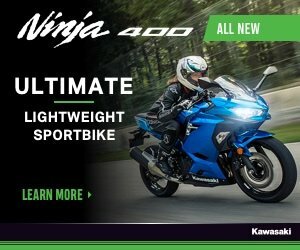 The company manufactured about 3,400 motorcycles in this period. 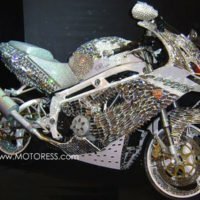 Their products were accurate copies of the US / American motorcycles of Indian. The heavy two-cylinder travel machines had the original an air-cooled (sports association) – V-engines of 750 cm (with 70mm of drilling and 78 mm stroke) that about 12 HP with 2200 rpm delivered. The engines were built with Siemens & Halske in Berlin. *A Mabeco motorcycle among other things is to be visited in the inventory of the Niederrheini Motorcycle Museum in Moers Asberg.